Today the digital drought ends for the Fantasy & Science Fiction Magazine. Amazon just announced that the title is now available as a Kindle exclusive. And to celebrate their new exclusive, Amazon are currently giving away subscriptions to a sampler section of the magazine. I actually had to read this a few times before I figured out what this was, but apparently it's not the full magazine. This teaser sub includes the nonfiction content, 1 full story, and summaries of the rest of the stories. They don't call it a teaser, but that's what it is. Still, free is free. Of course, the surprising bit of news here is how long this took. 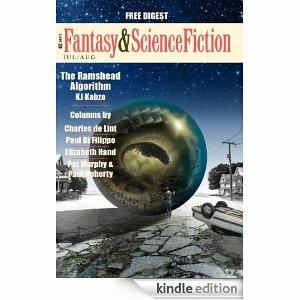 F&SF pulled their digital content from Fictionwise back in April. It's been over 3 months since they have sold any digital subscriptions. This being a sci-fi magazine, I'm sure that hurt their finances. I picked up a subscription for SF&F when I read this blog post this morning. This is the first digital magazine subscription I’ve got from Amazon. I’m impressed by how good it looks on an android tablet (iconia a500).